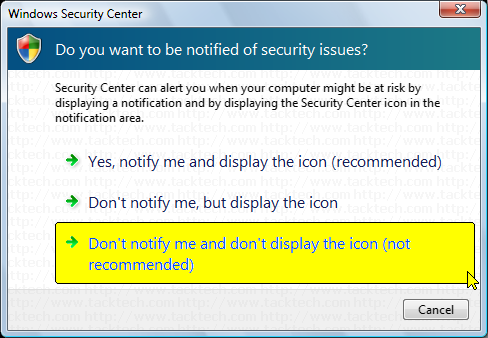 Disable Security Center Popup Notifications in Windows Vista (Windows Vista) - TACKtech Corp. 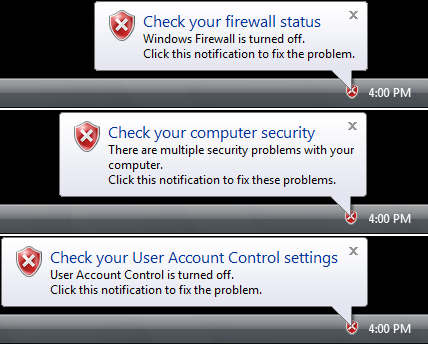 Tired of the Security Center Popup Notification balloons constantly informing your personal security preferences may be a problem? This Step-By-Step Guide will show how to disable them. 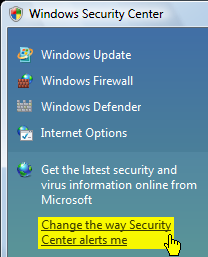 Click on the Security Center Popup Notification. Right Click on the Red Shield icon in the system tray. Select Open Security Center from the popup menu. Click on Change the way Security Center alerts me link. Click on the Don't notify me and don't display the icon (not recommended) option. Close Windows Security Center window.